Perovskite — have you heard of it? It’s a material that is getting a lot of buzz in the world of solar research. Now a U.K. solar startup plans to bring what it believes is a game-changing technology to make perovskite solar cells to the market. Two years ago, British researcher and entrepreneur Henry Snaith, and his team at Oxford University, were experimenting with a new class of compounds and discovered something rather unusual. Using these new compounds called “perovskites,” Snaith was able to tweak a solar cell’s composition to rapidly increase the amount of sunlight that it could convert into electricity. First he reached 10 percent, then 12 percent, then 15 percent, and finally 17 percent. He soon showed the solar cell to his co-founder, Kevin Arthur, at their four-year-old British startup called Oxford Photovolatics, which was working on another solar technology at the time. 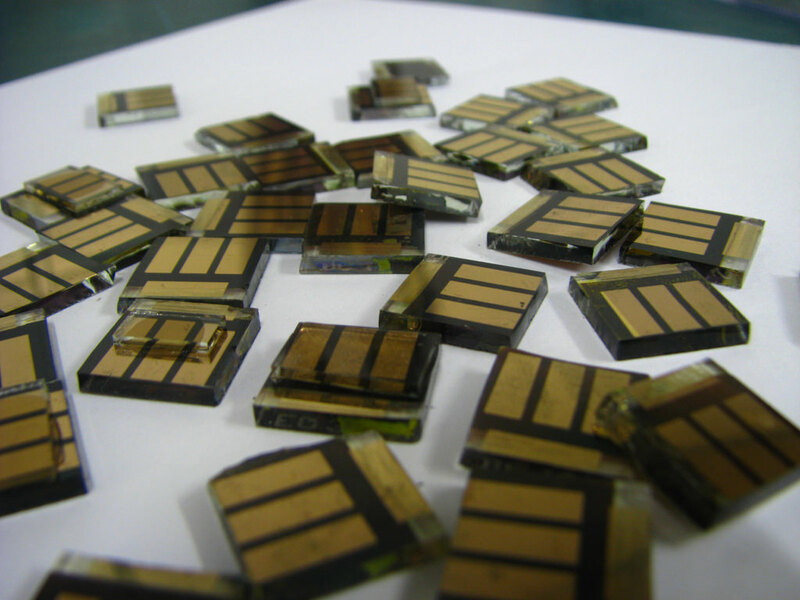 The company quickly pivoted to embrace perovskites. “It’s fastest improved solar cell material I’ve ever seen,” Arthur recalled, during our recent coffee meet up in San Francisco. The publication of Snaith’s research, which also involved scientists from Japan, in the journal Science in November 2012 helped to kickstart a love affair with perovskites in the world of solar cell material research. “A year ago there were four papers. There were 200 papers a month ago. It shows you the explosion of interest,” said Chris Case, Oxford PV’s chief technology officer, who joined Arthur and me during our interview. Perovskites are creating an excitement that I haven’t seen in the world of solar technology research for awhile. The rapid pace at which perovskites can boost a cell’s efficiency is a major reason (check out this chart). Paltry venture capital investments in new types of solar cell materials — a result of lackluster returns from an investment boom that started around mid-2000s — has also made this intense interest around perovskites worth watching. So far, despite the moves of Oxford Photovoltaics, the buzz is largely taking place in the academic world, though. We may never see dozens of perovskite solar startups getting billions of dollars of venture capital funding, something we saw with thin film materials CIGS (copper, indium, gallium, selenium) and cadmium-telluride. Many CIGS startups have gone bankrupt or been acquired for pennies on the dollar. The only notable cadmium-telluride solar cell maker is First Solar, which managed to fend off its one big rival, GE. So what’s that material again? Perovskites refer to a class of compounds with the same crystalline structure. The original perovskite was discovered in 1839 in Russia’s Ural Mountains and named after a minerologist, Lev Perovski. Most of the research since then has looked at using perovskite for electronic components, not solar cells. That mineral named after Perovski was calcium titanium oxide. But the perovskite used by Oxford PV has no calcium, titanium or oxygen, Case said. Instead, the company uses another compound, organometallic halide, to create that same crystalline structure. Oxford PV’s perovskite contains methylammonium, lead, iodine and chlorine, and it can absorb a greater spectrum of light than silicon, the material that makes up over 80 percent of the solar cells on the market today. The startup’s researchers tune the composition and structure of their perovskite to improve its sunlight-to-electricity efficiency and to make it possible for mass production. They also are developing a printing process for depositing the perovskite, which comes in a liquid, to create solar cells. After being heated, perovskite crystallizes, its atoms then self-assemble into shapes. Oxford Photovoltaics doesn’t plan to make its own perovskite cells, however. It wants to license the recipe for making the compound to a chemical company and the printing process to glass makers or silicon solar cell makers. The company plans to make money by charging a royalty for every cell or every meter of glass made. Perovskite films, courtesy of NREL. Silicon solar cell makers can lay down a layer of perovskite on top of their cells to boost their efficiencies, which fall mostly in mid to high teens. SunPower’s cells can go as high as 24 percent. Adding a layer of Oxford PV’s perovskite could increase a 15 percent silicon solar cell’s efficiency by 3-5 percentage points, Case said. That’s a bold promise because increasing a cell’s efficiency by just 1 percentage point is a big deal for silicon solar cell makers, as well as manufacturers of any other types of solar cells. Glass manufactures could use Oxford PV’s printing process to sandwich perovskite, along with other materials for tinting the windows, in between two pieces of glass. There’s a tradeoff between efficiency and transparency, though. The more light that a window has to let inside, the less the solar material will get to absorb to produce electricity. It seemed fitting for the interview to go over engineering glass for commercial buildings, given we were sitting by a huge window on the 32nd floor of the Grand Hyatt that offered a gorgeous view of downtown San Francisco. Embedding solar cells into buildings has always been more of a nice idea instead of an economical approach. Solar cells that won’t obstruct the view that a window offers historically have done poorly in converting much sunlight into electricity. Other types of solar cells have been too expensive to make. Plus, they won’t produce as much electricity when they line one side of a building rather than its rooftop, where they get sun for longer hours each day. For many architects and building owners, adding solar needs to generate enough financial benefits — such as enough energy savings to lower utility bills — to justify their costs. A solar technology that could produce lots of electricity at low costs would certainly offer a more attractive option. Smart windows from View, image courtesy of View. 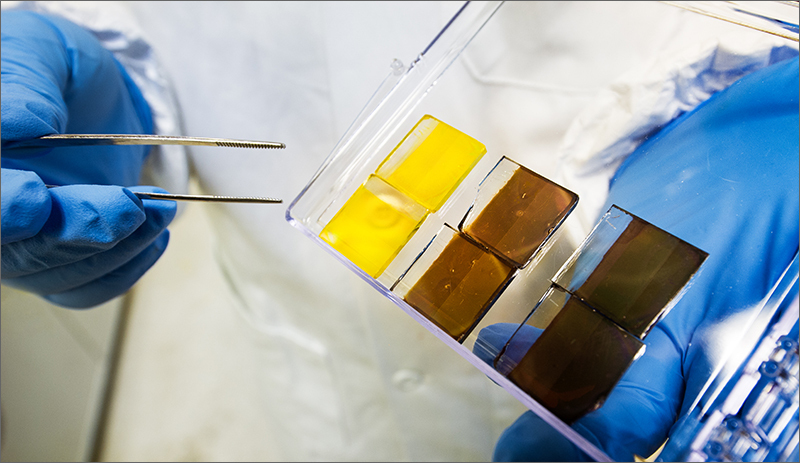 Oxford PV is moving toward commercializing its perovskite technology. The 17 percent cell is the best achieved in its lab so far, but making sure the technology could produce similarly efficient cells at mass production is always a big challenge for any solar startup. The company has built out a pilot production line to demonstrate its manufacturing process. And it’s working on showing that its pervoskite will perform as promised and last over 20 years, the expected life span of solar cells on the market today. The startup plans to start field testing its technology this year. The company has raised £7 million in venture capital and grants. Arthur is working on raising a B round of £15 million in two tranches and hopes to close the first one before the end of the year. 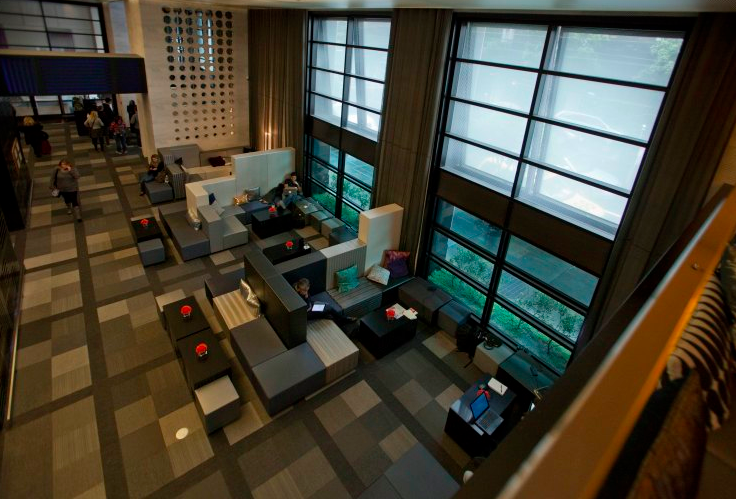 The company is looking at opening an office in Silicon Valley. Oxford PV is an early player in introducing perovskite to the solar market, so how well it succeeds will be closely watched.